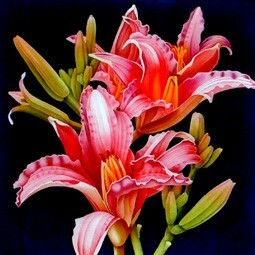 Flower paintings are often dismissed as commonplace therefore I want my silk paintings of flowers to be special and entertain the spectator. The design is the most important and in some ways the most difficult part of the process. Consequently I always spend a considerable time working it out. I take lots of photographs and I make sketches. Photographs provide a good record of colour but observational sketches are invaluable in recording shape and form. Sometimes the elements of design come together naturally to produce a composition that is interesting and aesthetically pleasing to the eye. At other times I find it useful to employ certain design principles to realize the latent potential of the visual resources I have brought together. For me the essential aspect of any design is Unity of composition. All the sections should be related in some way. This is often achieved by using related lines and shapes. Although my silk painting 'Daylilies' illustrates several design principles, when I looked at my initial sketches I decided to develop what I considered to be the dominant feature, the related smooth curving lines, shapes and texture of the petals, to give unity to the design. I placed the flower heads close together so that they overlapped giving extra depth to the composition. Balance is another very important element. It brings stability to a design and can be symmetrical or asymmetrical. I usually use an asymmetrical balance because of its informality. Small shapes are placed further out near the edge and balance large shapes placed near the centre of the picture. Then although the composition is balanced it appears active and dynamic. Repetition and Alternation (what occurs between the repeats) also give life to a design. 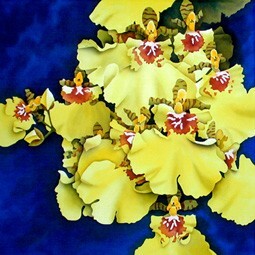 My silk painting 'Dancing Ladies Orchid' illustrates these last three aspects. Asymmetry plus repetition with variety creates an exciting visual rhythm. My silk painting 'Pinks' on the cover has repeated and alternated shapes and colours, asymmetrically counterbalanced. 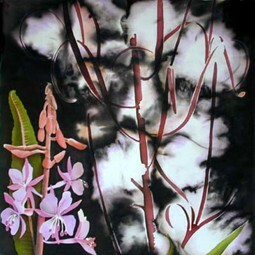 My silk painting 'Fireweed' shows how a picture can be brought to life by introducing Conflict into the design. This conflict is between juxtaposed versions of the design elements, straight lines against curved; lightness against darkness; hard edges against soft, curved shapes against angular and large objects against small. The introduction of conflict risks destroying the unity of a design but by making one element dominant the conflict is resolved, balance is restored and unity regained. In this example the flower spike of the Rosebay Willowherb restores balance to the design. The mood of a painting can be accentuated by the use of Harmony and Gradation of colour and texture. 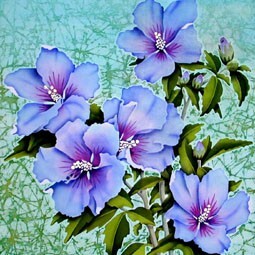 In my silk painting 'Hibiscus - Bluebird' a tranquil mood is created by the use of a harmonious gradation of colours and a soft gradation of background texture. In each of these examples I have singled out certain aspects of design that are to a greater or lesser degree common to them all. We may not knowingly employ design principles in our work but when a painting is not successful it is usually down to poor design however skilfully it is painted. When we produce a successful design it is useful to use these principles to analyse the painting. By doing so we become more aware of the importance of good design.